Today they are believed to benefit their walkers by relieving stress, expanding one’s aura, balancing right/left brain functions, calming children with ADHD, and aiding in communication with the unseen world. Mostly they are fun and make one feel good. Having designed more than 150 labyrinths over the past 20 years, I have many insights and stories to share with dowsers. The most important suggestion is; every permanent labyrinth needs to be dowsed in place in order to insure the highest good from its use. Without dowsing labyrinths have been known to cause wells to go dry and basements to flood. 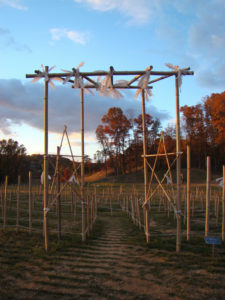 The entrance to Stargate, a labyrinth I build in NC for an art show in 2009. By Marty Cain; Artist, Dowser, Geomancer, Writer and Life Member of ASD.